You can complete a form. Maybe there’s a phone number to call. Or in some cases, you might even be able to make an appointment with a real live individual. In business and government services, it’s a mark of sound practice to provide people with a means of filing complaints. But what are Christians to do with their complaints over another Christian – or even an entire church? What we find, as with most things, is the Church is called to practices quite different from that of a business or government agency. I know, it’s a crazy thought – a Christian complaining about those to whom the Spirit has bonded them in peace (Eph 4:3)?! It’s almost as preposterous as former slaves complaining about their liberation and longing for the good ol’ days of oppression (see Num 11:1-6). The selfishness of the human heart will eventually express itself in grumbling and complaining, irrespective of how many people God has already killed for that sin (1 Cor 10:10-11). None of us can avoid having complaints and the New Testament assumes that other Christians will even provoke them! Just consider the assumption behind such commands as Eph 4:2, “with all humility and gentleness, with patience, bearing with one another in love.” The Bible assumes that Christians will have to work on being humble and gentle with other Christians. And that other Christians will require patience, even bearing or tolerating them in love. Clearly, the New Testament’s picture of the local church is not that of R.E.M., a bunch of “shiny, happy people holding hands.” No, it’s an assembly of calledsinnerswho’ll have to lovingly tolerate a bunch of irritating qualities in one another, with patience and gentleness relating together in humility. In short, the Bible assumes that Christians will face reasons to complain about each other. Let’s be honest, our experience has confirmed that in spades, hasn’t it? No single one of us can avoid having a complaint – or twenty-eight. As long as we have a mind and heart that prefers what we prefer, and we live with others who do the same, the friction when we meet will spark complaints. So where again can we find the Complaint Department? When we have a grievance toward another Christian – whether it’s real and substantiated or just a nagging perception that we can’t shake – if we are disciples of this above-quoted Master, we’ll “go and tell him his fault.” It’s clear, unequivocal, and without exception. 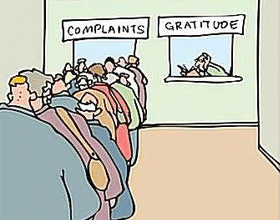 Christians file complaints with the one(s) they have a complaint about. But can we expect that Christians will always do this? Well, yes and no. Christians will not always obey Matthew 18:15. They will grumble and complain to the wrong parties – that’s been the cost of doing business for quite some time. But should we expect Christians to obey Matthew 18:15 anyway? Yes, and we should label their misfiled complaints as what they are, gossip. Ask: “Why are you telling me this?” (This may hopefully stop the whole thing, but at least try to help the person who’s not conscious they’re gossiping). Ask: “What’s the difference between what you’re telling me and gossip?” (Same effect and potential benefits as #1). Ask, “How is your telling me that thought, that complaint, that information going to help you and me love God and our brothers better, and knit us closer together as a church in Christ’s love?” (This is, of course, the goal [Eph 4:1-16]). Ask: “Now that you’ve told me about that, what are you going to do about it?” (This is now implicitly raising their accountability to Matt 18:15, among other commands). Say: “Now that you’ve told me about that, you’ve morally obligated me to make sure you talk to ____ about it. How long do you think you need, so I can know when this becomes a sin that I will need to confront in you?” (They may refuse to follow Matt 18:15, but you cannot. If they do not proceed to speak to the appropriate individual, you must then tell them their fault). Read Dan’s entire post. This five-step process will help dose the fire of quarrels, provided that we refuse the sinfully delicious food of gossip (Prov 26:20-23). And this is God’s prescription for handling the (unavoidable) complaints in our churches. As Dan further encouraged: “… you may head off a church split, division, harmed souls, sidelined Gospel ministry, and waylaid discipleship.” For “Gossipkillschurches.” Sad, but true. In the interest of full disclosure, I learned this lesson the hard way. Years ago in another ministry, I became the complaint department for two other co-laborers. While my conscience would spasm at times, admittedly I enjoyed too much how my friendship with these brothers seemed to grow as they grumbled. It felt like we were “being real” in our fellowship or that we were possibly even bearing one another’s burdens. But we were not. Their “burden” was another brother, these were misfiled complaints, inexcusable gossip. And I had wrongly savored their words (Prov 26:22). By the time I came to my biblical (obedient!) senses, and realized that our Lord had not stuttered when He spoke Matthew 18:15, it was too late. After confessing my recovered conviction to my friends, they were stunned – as though I was now refusing their friendship. Too much bitterness, sin, and misfiled complaining had been aired between us that a friendship on any other (obedient, Christian) level seemed insincere. Eventually, a bitter split between them and the other brother occurred that, to my knowledge, has never fully been healed. Potential progress in the Gospel ministry was halted. And to this day, the guilt of knowing that I was an accomplice stays with me. I wonder, what growth, change, or fruit might have come if I had obeyed Jesus and asked those five questions, instead? If complaints are filed with the proper individual(s), great damage can be avoided and many relationships salvaged – even deepened! But not just that, we preserve the Church and God’s glory in Christ before a watching and perishing world (John 17:21; Eph 3:21)! In every church of which I’ve ever been a member, I’ve never observed an issue or complaint that couldn’t be resolved – only people who wouldn’t resolve them. Too often, their refusal to deal with their complaints as obedient Christians was aided and abetted by other Christians who served as a de facto complaint department. However unwittingly, these willing ears only served to exacerbate, extend, and deepen the problems. Ultimately, these Christians were outwitted by the designs of the evil one, rather than walking after the Holy Spirit (Eph 4:3, 28; cf. 2 Cor 2:11). When people have complaints or concerns about their brothers or sisters, they do not need a shoulder to cry on. Much less do they need someone to whom they can freely vent. They need to be lovingly, calmly, but no less convincingly stopped – perhaps even interrupted – and directed to file their complaint with the proper person. Resolve before the Lord not to be your local church’s complaint department. It may be a good practice in a store, but it’s deadly to the cause of Christ in His Church. Indeed to me the statement before us is not only stupendous, it is staggering. ‘Through him, we both have access – access! – by one Spirit, unto the Father.” Our chief trouble, and the whole trouble with the Church, is that we do not realise the meaning of a statement like this. Were we to do so the Christian Church would be revolutionised. Were we to do so we should be lost in ‘wonder, love and praise’. We should realise that the most marvellous, wonderful thing that can ever happen to anybody in this world is simply his becoming a Christian. If only every Church member, every Christian in the Church, realised the truth of this statement, the Church would be so different that we should scarcely recognise her. But oh, how different is the Church from what we find here! How many think of Christianity and of the Christian Church simply as a place which they attend now and again, and that perhaps in a perfunctory manner, hesitating, and doubtful whether they will or not, and as a matter of duty; or as a place in which they may exercise certain gifts that they have, and be busy – a kind of club, an institution, a human society. What a contrast to what we have here! This is Christianity, this is what makes one a Christian. The Christian Church really consists of people who realise that this is the whole object and purpose of everything – access by one Spirit unto the Father. – God’s Way of Reconciliation (Baker, 1972), pp. 245-46. While we mull over the year that’s past and consider the year yet ahead, invariably we will have to face one practical question what should I be doing, now? Surprisingly, thats not always the easiest question to answer. For we each confront a combination of perplexing situations, regrettable failures, as well as multiple opportunities and at times they can all seem to simultaneously demand our attention. Truly, considering what we should do can get confusing. The LORD is with you while you are with him. If you seek him, he will be found by you, but if you forsake him, he will forsake you. For a long time Israel was without the true God, and without a teaching priest and without law, but when in their distress they turned to the LORD, the God of Israel, and sought him, he was found by them (15:2-4). And they entered into a covenant to seek the LORD, the God of their fathers, with all their heart and with all their soul, but that whoever would not seek the LORD, the God of Israel, should be put to death, whether young or old, man or woman. They swore an oath to the LORD with a loud voice and with shouting and with trumpets and with horns. And all Judah rejoiced over the oath, for they had sworn with all their heart and had sought him with their whole desire, and he was found by them, and the LORD gave them rest all around (vv. 12-15). Literally, v. 12 reads they entered into the covenant to seek the LORD (see NASB), that is, the covenant that the Lord had made with Israel to be their God and they His people (e.g., Exod 19:5-6). So renewed in worship together, Judah rejoiced and did find our faithful God who gave them rest. Repeatedly, the Lord has reminded me that this is where His people are always to begin. It is this same truth that assured Paul in the turmoil of his life and ministry. Paul served the even more glorious new covenant (2 Cor 3:6-11) and by that covenant, he and every Christian are promised the freedom to behold the glory of our Lord, Jesus Christ, and be changed into His glorious image (3:18). It was because of this promise that Paul did not lose heart (4:1). Undoubtedly, as we leave 2013 for 2014, we face many confusing situations, many opportunities that beckon us, and yes, all the lingering consequences from things that we should not have done. So what should we do? I cannot answer every specific, but I do know that we must begin by embracing this glorious new covenant and seek our God. Would you begin 2014 by seeking Him? Lets ask that He may revive our contemplation of His glory in the face of our Lord Jesus. Lets ask Him to turn our hearts away from so many distractions and from leaning upon so many false supports. And lets ask the Lord for His Spirit to revive a heart of earnest prayer and longing with all their heart and with all their soul.” If this new year is to be a happy one, itll be so through the joy and rest that may be found in Him alone. Lets seek Him. Does the Lord Want a Birthday? Each December, I reflect on how the Lord brought me to hear and believe the Gospel. Not because of Christmas absolutely, but because my own conversion to Christ is quite intertwined with Christmas. Before we were Christians, typically the only time my family went to church was on Christmas Eve. So my primary exposure to the Church and Christianity early in life was related to Christmas. What I typically heard at each service was some attempt to connect the elements of a traditional Christmas to the Lord Jesus. There was the pastor who read through a presentation of how normal ornaments remind us of God. Another pastor even dressed-up like ol’ Saint Nick himself! Even though my understanding of Christianity was limited and desperately inadequate as an unbelieving kid, I distinctly remember thinking: “This is a reach.” Because I would return to our tree, gifts, and ornaments self-consciously confused. Seriously, this was all about Jesus? Something didn’t add up. Then, on December 26, 1993, our family first visited the church at which I would eventually hear and believe the Gospel and it was for a Christmas music cantata! I became a Christian the following summer of 1994. But the next Christmas, which was my first as an actual Christian, here’s the thing – I was even more confused. Trees, gifts, and pastors in red pajamas made even less sense! As I wrote previously, in Revising Christmas, Again, the difficulty we face in making Christmas about the Lord Jesus is not a new problem. It’s a very ancient one. Reality is that there’s never been a time when Christmas was a simple affair focused on Jesus. And just by surveying the Gospels, we can begin to see why. Did the Lord Want a Birthday? As you read the Gospels, you’ll notice that they’re fairly sparse with information regarding Jesus’ birth. That’s a conspicuous oversight when you consider the preponderance of detail we have regarding the His death and resurrection. We can date His death on the cross and the empty tomb with some precision, in early April, 33 (see Paul Barnett, Jesus and the Rise of Early Christianity for a discussion of dating). What does that indicate was the crucial (from Latin, crux, “cross”!) event in Jesus’ life for the earliest Christians and the real burden of the inspired chroniclers of Jesus’ life? Apparently, it wasn’t His birth. Now Origen had more than a few theological hang-ups, and I really like my birthday, so I’m not saying we should give those up, but it is a striking contrast, isn’t it? Our inability to calendar and celebrate Jesus’ birthday provides us, I believe, with an important lesson. Pagan emperors focus on their births because they’re never going to rise from the dead to rule the universe. They’re never going to be highly-exalted with a name above all others. They’re never going to be raised so that every tongue confesses them as Lord (Phil 2:8-11). It sort of helps explain why the Lord may not even want a birthday. When you compare it to universal exaltation, who cares about having a pitiful party like Caesar? It’s that time of year when culture warriors take up arms to keep worldly and pagan ideas from encroaching on the spiritual and biblical reason for the season. So Sarah Palin’s fired a salvo against the “war on Christmas” by “revisionists” who’re turning it into a “winter solstice” celebration. (This is to prepare us for her new book, Good Tidings and Great Joy: Protecting the Heart of Christmas, ostensibly on the same theme). And beware lest you raise your eyes to heaven, and when you see the sun and the moon and the stars, all the host of heaven, you be drawn away and bow down to them and serve them, things that the Lord your God has allotted to all the peoples under the whole heaven. But the Lord has taken you and brought you out of the iron furnace, out of Egypt, to be a people of his own inheritance, as you are this day (Deut 4:19-20). What if the pagans are correct that late December celebrations are rooted in the winter solstice? That would explain some of the odd accoutrements to celebrations of Jesus’ birth. I don’t know about you, but I’ve never been able to make out what evergreen trees, lights, gifts, and too much egg-nog have to do with the little town of Bethlehem. Without being too much of a Grinch, it might be worth asking whether the real “revisionist” is actually Mrs. Palin. Though to her credit, she stands in a long, long line of revising this holiday. Celebrations on December 25th were regular long before Jesus was ever born, being motivated by seasonal change, human culture, and very pagan religions. The original revisionists took that pagan holiday and called it “Christ-mass” about 400 years after He was born in Bethlehem. Yet, that’s not even the Christmas we know (and fight for!) today. For the next group of revisionists were 19th century New Yorkers who wanted to spare their newly urbanizing society by transforming Christmas from a violent drunken riot into something a bit more domestic. Late-December festivities were deeply rooted in popular culture, both in observance of the winter solstice and in celebration of the one brief period leisure and plenty in the agricultural year. In return for ensuring massive observance of the anniversary of the Saviors birth by assigning it to this resonant date, the Church for its part tacitly agreed to allow the holiday to be celebrated more or less the way it had always been. From the beginning, the Churchs hold over Christmas was (and remains still) rather tenuous. There were always people for whom Christmas was a time of pious devotion rather than carnival, but such people were always in the minority. It may not be going too far to say that Christmas has always been an extremely difficult holiday to Christianize (pp. 7-8). Since this season has been difficult for Christians for centuries, what better time to return to the blog? Lord willing, in the days to come I hope to post a mix of historical clarifications on the development of Christmas, reflections on the birth of our Lord as recorded in Scripture, along with how we may try to seek to honor the Lord Jesus over all things, even at Christmas. And who knows, maybe we can begin to revise Christmas, again. Let the pastors boldly dare all things by the word of God. . . .
Let them constrain all the power, glory, and excellence of the world to give place to and to obey the divine majesty of this word. Let them enjoin everyone by it, from the highest to the lowest. Let them edify the body of Christ. Let them devastate Satans reign. Let them pasture the sheep, kill the wolves, instruct and exhort the rebellious. Let them bind and loose thunder and lightning, if necessary, but let them do all according to the word of God. Cited in John Piper, ed., With Calvin in the the Theater of God, pp. 136-37. Do We Care About Persecuted Christians? On Tuesday, I began a slow return to virtual society at the Cripplegate with a post on Do American Christians Care about Persecuted Christians? 1. Our media is focused on America. 2. Our spiritual and biblical ignorance of Christian fellowship. 3. Our understanding of Christianity is unbiblical. 4. Our hands feel tied. With the International Day of Prayer for the Persecuted Church weeks away (IDOP 2013), it seems like a timely subject. I found interaction in the comments to be uniquely helpful as well. You can read the entire article and comments here. International Day of Prayer for the Persecuted Church (IDOP) is the Lord’s Day, November 3rd. Do American Christians Care About Persecuted Christians? The Church is under fire. At that sentence, half the people who started reading this article just moved on to something more interesting. However, that response is troublesome. The plight of believers gets little attention on the global stage, leaving many Christians throughout North America unaware, and therefore, indifferent to whats going on in the body of Christ. Mention persecution, and eyes glaze over. The indifference of American Christians to the persecuted church around the world does seem conspicuous. For one example, I’ve observed that when a prayer meeting is devoted exclusively to interceding for persecuted Christians, it’ll likely be one of the most poorly attended. 1. Our media is focused on America. Nettleton says, “Our media covers things that are happening in America. In a 30-minute news program, we might get two minutes of whats going on around the world. That’s so true, I’ve pretty much entirely given up on the American news media. Over the past decade, these and similar [Islamic] groups have been remarkably successful in persuading leading public figures and journalists in the West to think of each and every example of perceived anti-Muslim discrimination as an expression of a systematic and sinister derangement called Islamophobiaa term that is meant to elicit the same moral disapproval as xenophobia or homophobia. But a fair-minded assessment of recent events and trends leads to the conclusion that the scale and severity of Islamophobia pales in comparison with the bloody Christophobia currently coursing through Muslim-majority nations from one end of the globe to the other. The conspiracy of silence surrounding this violent expression of religious intolerance has to stop. Nothing less than the fate of Christianityand ultimately of all religious minoritiesin the Islamic world is at stake. If Islam is defamed, the media reports religious bigotry. When Christians are harassed or killed, it’s just “civil strife” – John 15:19 is still true. Unfortunately, if American Christians get their news from most American media outlets, they’re going to view the world through the lens of those who hate them. I’d guess that ignorance of these truths finds its source in the general personalization of Christianity in America – not to mention how many local churches are now sequestered into small groups. If the average American Christian can’t explain why they should care about all the members of their own church, why would they ever care for their brethren around the world? Addressing this factor then requires instruction from Scripture and the practice of faithful polity and membership in our churches. 3. Our understanding of “Christianity” is unbiblical. Nettleton explains, “Its not presented as this is what the Bible said was going to happen. This is what Jesus said if you follow me, the world will hate you. This is happening all around the world. Followers of Christ are being hated because theyre followers of Jesus Christ.” Unfortunately, the Schuller-Hybels-Warren-Stanley philosophy has become the dominant redefinition of “Christianity” in our land. So many American Christians have been trained to think that success is gaining the applause, accolades, and admiration of the world. Despite the fact that the Lord Jesus warned His disciples that they’re among the cursed “when all people speak well of you” (Luke 6:26) and Paul wrote (from prison!) “all who desire to live a godly life in Christ Jesus will be persecuted” (2 Tim 3:12). As I’ve previously written in Am I Really Suffering for, by, and in Christ?, if professing Christians only experience love from the world, it’s probably because they really just belong to the world and not to Jesus (John 15:19; Jas 4:4). 4. Our hands feel tied. The great thing about American culture is that we’re “doers,” we like to fix things – and we’re generally optimistic about surmounting challenges. But in this case, we feel helpless. The article explains, “Sometimes Americans avoid the discussion of the persecuted church because the news is discouraging. Its hard to hear and yet feel helpless about changing anything.” As doers, American Christians need to learn that praying is doing! And, like earliest Christians, responding to persecution with prayer to our “Sovereign Lord” is a good response (e.g., Acts 4:23-31; cf. 2 Cor 1:11; Eph 6:18-20). The persecuted church is strengthened because we can encourage them, we can stand with them, and we can be a voice for them. But were strengthened as well because we see their faithfulness, and we see Gods faithfulness to them. And our faith is encouraged and challenged, and we find that we grow spiritually, as well. It seems like what we need, is what our churches always need – faithful instruction and example from our pastors and teachers. But I’m curious, what do you think? Are there other explanations for American Christians’ apathy toward persecuted brethren? And how would you suggest we begin to address it? We had just sung the Doxology, concluding our evening family worship. The kids were scurrying from my lap to their beds. But once I began to stand – pain! Suspended at a 45-degree angle, I couldn’t move and it only went downhill from there. The real low-point, equal part humiliating and excruciating, was having to crawl across the living-room floor to our bedroom. It was a longer trip than usual, though it afforded me the opportunity to thank God for the regularity with which my wife cleans the floor. But then came the moment when I actually had to pull myself into bed. For the record, I neither cried nor cursed. But I am glad that that particular moment was not videoed. That’s were I spent the following two days – flat on my back. Until those wonderful muscle-relaxers, which the Lord have given us richly to enjoy (1 Tim 6:17), allowed me to stand and shuffle a bit. Turns out I have a herniated disc at the L5. It was obvious on the MRI, the disc that’s black and squished flat like an overcooked hamburger – yeah, that’s not normal. Fortunately, it’s minor and will not require surgery. The cause is anyone’s guess. Maybe it was when I was rear-ended three years ago. Or maybe it was high school football – after all, I was the skinny receiver, linebacker fodder over the middle. But what’s most likely is all those days in seminary, and afterward, where I sat 18 or even 20 hours studying and working. Whatever the original cause, in the Father’s sovereign and sanctifying discipline (Heb 12:5-10; 2 Cor 4:17-18; Rom 8:28-30), family worship put me flat on my back. We’re very fragile. It’s frankly embarrassing that I’ve got no great story to go with this injury – no children were saved from a burning wreckage or anything worthy of even a blog post. I just stood up. It’s a good reminder that we’re but dust (Ps 103:14) and will one day return to it forever (Ps 90:13). A mist, that’s evaporating even now (Jas 4:14). Pride grows in the most hidden places, like taking your most basic physical abilities for granted. So it’s only grace when the Lord humbles you and reminds you that you’re sustained only by the word of Christ’s power (Heb 1:3). I need more wisdom to number my days and redeem whatever time and strength He sees fit to grant (Ps 90:12; Eph 5:16). Wives are good (Gen 2:18). When I hurt my back, my wife was already caring for 3 kids under 4 yrs who were sick. Tirelessly, she’s served with care and forethought, without complaint or grumbling, knowing that all of this was from the Lord and seeking Him in prayer. Make no mistake, an ezer (from , “helper” or “support”; cf. Gen 2:18, 20) is no doormat or weakling – in fact, Moses uses ezer to refer to the Lord Himself (Exod 18:4, “The God of my father was my help”). My wife is a strong support and in her I’ve found a good thing. You can’t beat a hardworking and pretty Calvinist! She’s embodied “favor from the LORD” (Prov 18:22). It’s good to be nothing. Related to that thought, it’s therefore quite pointless to run yourself into the ground (or flat on your back, as the case may be), because you believe you’re actually needed. You’re not.Unless the Lord builds, all human efforts are futile (Ps 127:1-2). Being unable to drive, or to sit, or even to focus much because of the pain (and those blessed med’s alleviating it), has had it’s sanctifying purpose – it’s sweet to be nothing. and have not the least dependence upon me. It is sweet to be nothing and have nothing, and to be fed with crumbs from Thy hands. Blessed by Thy Name for anything that life brings (“Reproofs,” in Valley of Vision). There are a few more thoughts, but perhaps I’ll leave them for another post. When all is said, at least I have one more reason to encourage family worship. It may just put you flat on your back and that’s not such a bad thing.